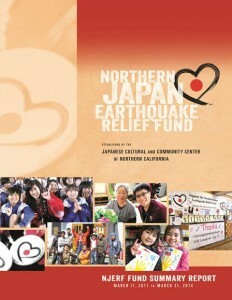 On March 11, 2011, the JCCCNC immediately established the Northern Japan Earthquake Relief Fund (NJERF) to aid the survivors of the Great Eastern Japan Earthquake, tsunami, and subsequent nuclear disaster. The Relief Fund plan is a three-fold plan for relief, recovery and rebuilding, which is believed to take more than five years. The campaign - a community and volunteer driven effort - grew to become the largest Japanese American community based relief fund in the United States with over 12,000 donors, 25,000+ members on Causes.com, and more than 300 events raising over $4 million. 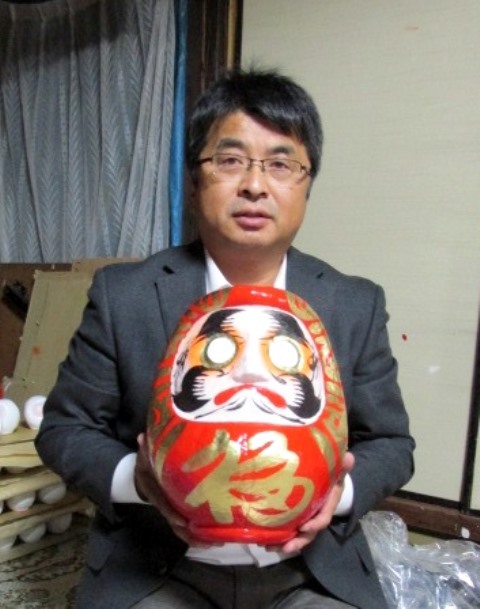 13th generation Master Moriei Watanabe of Shirakawa Daruma has been carrying on his family’s 300 year old business by making daruma for the past 40 years. He believes that it’s important to preserve the traditional style of daruma and by doing so was recently awarded historic preservation status by the Shirakawa government as an original footprint with many areas of his workshop remaining unchanged since the Edo period. Master Watanabe’s wife and artist Sachiko Watanabe will also be here. 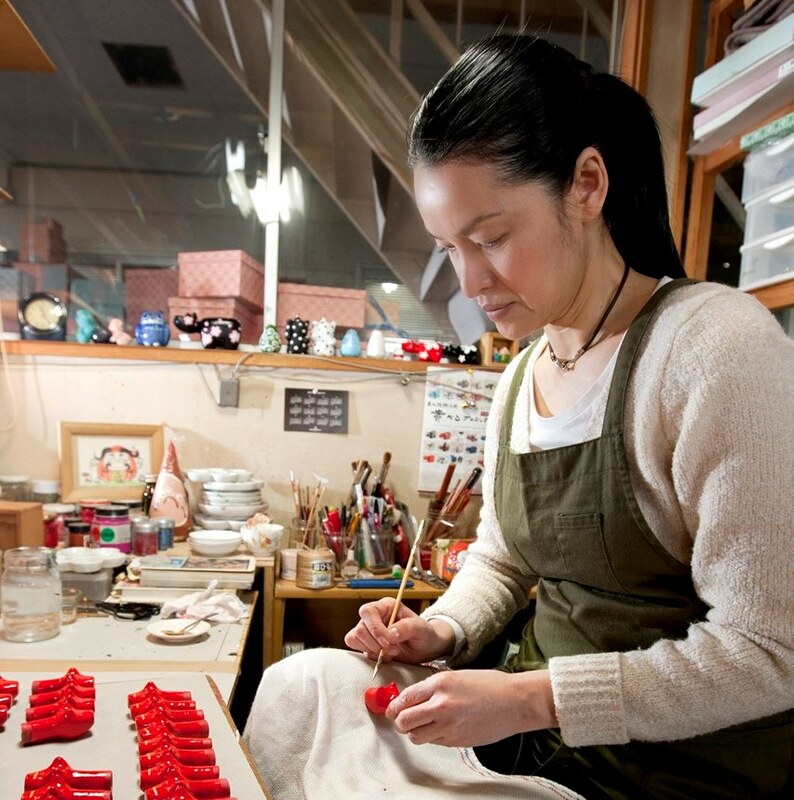 She uses the traditional base but creates unique, specially designed daruma for events, individuals, businesses, like those for former SF Giants players Aoki and Ishikawa. Kokeshi Master Koyo Asakura of Asakura Kokeshi Do is the 8th generation Asakura carrying on his family business of producing the Togatta style kokeshi doll. 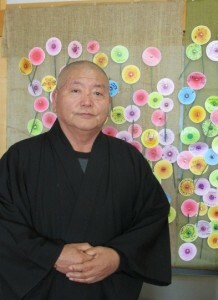 He can trace his family business back to the Edo Period (1600-1868). His shop was severely damaged by the 3.11.11 earthquake and tsunami but he was able to rebuild the studio and has been continuously making his famous style of kokeshi since. As kokeshi enthusiast know, it is important for masters to be a part of each phase of creating a doll, including the selection of the tree that serves as its foundation. Asakura uses mizuki (birchwood) and has remained loyal to his family’s 200 year process. Minako Hayakawa of Nozawa Mingei Hin works with her father Master Hourin deep in the mountainside of Nishi Aizu. They are hariko artists and are the main producers of akabeko in Japan. 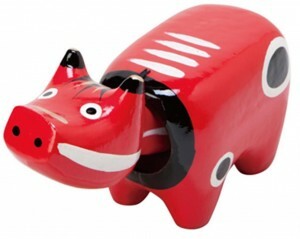 Akabeko are red painted papier-mache cow that are synonymous with this region in Fukushima. 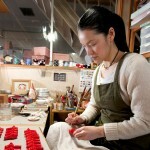 Although Minako helps create the traditional akabeko that they are known for, she also creates more contemporary hariko, which include uniquely designed beko and okiagari koboushi, which are good-luck or wish charms. She paints well recognized figures and creative designs to encourage younger artists and customers to once again take interest and pride in mingei crafts. Five years ago in 2011, the lives of millions of people in the Tohoku region of Japan were changed forever by one of the worst natural disasters in world history. Learn about the current situation and ongoing recovery efforts in Fukushima prefecture by members of the Association for Relief in Japan, a relief organization working in the region. The program will also include greetings from community leaders, a performance by Nihonmachi Little Friends Afterschool Program, a slideshow and light refreshments from the Tohoku Region. An exhibit of 200 akabeko for the Akabeko for Hope Project will also be on display. Artists and non-artists of all ages and levels were invited to participate to share messages of hope and encouragement by designing an akabeko that will be displayed at the JCCCNC for the 5th anniversary and then sent to residents of Tohoku. About the Project, Akabeko and Nozawa Mingeihin: In 2016, in commemoration of the 5th Anniversary of the Great East Japan, Earthquake, Tsunami and Nuclear Disaster, the JCCCNC will focus its efforts to revitalize cultural arts/artists in Fukushima. The JCCCNC will be working with Nozawa Mingeihin artists to showcase the akabeko for the Remembrance Event at the JCCCNC on March 11, 2016 and for artist workshops later in the year. An akabeko is a folk toy of a mythical cow. It was created to honor a cow that helped build the Enzoji Temple in the 9th century as a symbol of loyalty and strength. Because of its red color, it is also believed that possessing an akabeko can ward off illnesses. In 2011, the akabeko revived itself to the world as people in Japan and other countries, including the U.S., purchased them as symbols of perseverance to honor the residents of Fukushima and support those in Tohoku who had lost their lives, livelihood and homes. The JCCCNC is extremely honored to be working with the Nozawa Folk Craft Shop in Nishi Aizu to introduce their version of the akabeko. 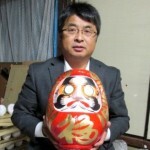 Master Hourin and his daughter MInako Hayakawa carry on the 400 year old tradition of Aizu hariko (papier mache) by creating akabeko, traditional masks, wish balls and other hariko crafts. Special Thanks: The Henri and Tomoye Takahashi Charitable Foundation, Paper Tree, Mountain Valley Paper Company and Miki's Paper. Stories and Songs Performance 12:00-1:00 p.m. 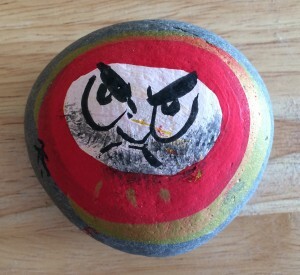 Priest Katayama will lead a workshop for you to create your own daruma rock to REMEMBER 3.11 and remind you to never give up! 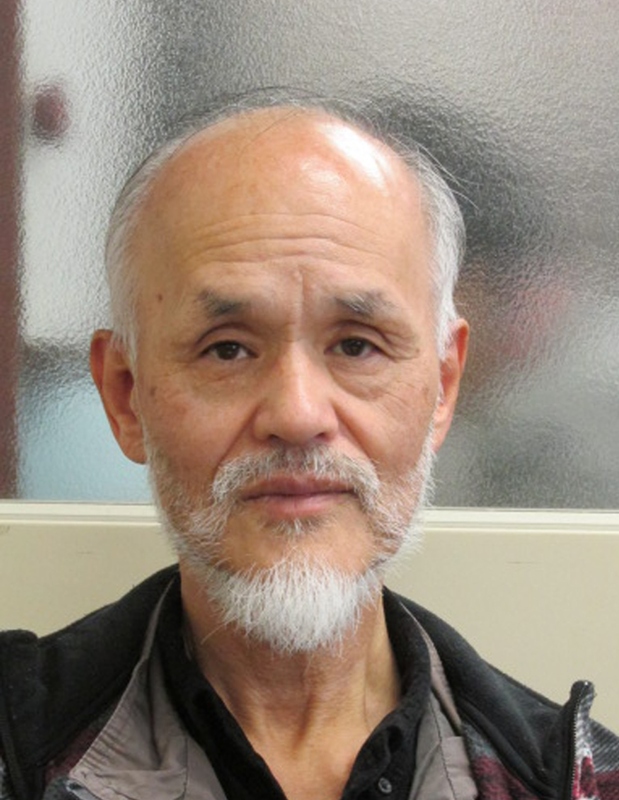 Join us in welcoming Priest Shuko Katayama, Head Priest of the Jifukuji Temple in Kesennuma, Japan. He will be visiting San Francisco to remember the 5th Anniversary of the Great East Japan Earthquake, Tsunami and Nuclear Disaster. The Jifukuji Temple is located within sight distance of the Pacific Ocean in the City of Kesennuma, Miyagi Prefecture Japan. Thus, when the tsunami hit this fishing town on 3/11/11, the majority of the temple’s members perished. 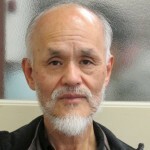 This sad and dark event deeply affected Priest Katayama who took it upon himself to create a campaign to not forget his members by creating the motto “We will not break; we will not leave and we will not give up.” As part of his campaign, he also launched the Umibe no Mori wo Tsukurou initiative to build a wall out of trees and saplings to protect the residents from any future tsunami.